The fictional plot [where terrorists use an MMO to plan attacks] was originally developed by Dan Arey, for the Director of National Intelligence's Summer Hard Problems workshop, or SHARP. And its details are a little fuzzy. The terminology doesn't match World of Warcraft lingo, all that precisely. 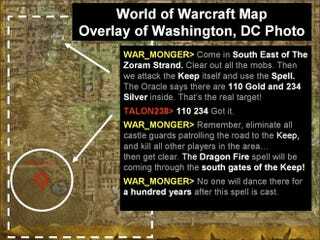 There is no "White Keep" in World of Warcraft; "Dragon Fire" is a spell in EverQuest, the old-school role-playing game, not WoW.